Sometimes I consider deleting old blog posts that no longer represent how I see Kibbe’s system. I try and go through my posts every few months and add notes to posts that I feel represent an idea that I’ve “archived,” so to speak, and that no longer factor into how I see Kibbe’s system. But I keep on seeing these posts referenced in other places regardless, and I feel like I’m confusing people, despite my clear note explaining that I no longer agree with what I wrote. One of the major ideas that falls into this category are the ideas of a “curvy FG” and “g-leaning” and “f/n-leaning” FGs. Seeing these terms now make me twitch. I’ve come to realize that I am not a curvy FG. I am simply an FG. Part of this confusion is, of course, due to the idea that Kibbe has gotten rid of the middle types. Gamines and Flamboyant Gamines have different body shapes. Gamines are narrow and straight in addition to being angular, sharp, etc. and Flamboyant Gamines are broadly angular. “Broad” is the key word here, because it’s the major idea that gets lost. The broadness is what makes the Flamboyant Gamine recommendations possible. If you want to hang a boxy top off your shoulders, you need broad shoulders to do it. All of the things that define Flamboyant Gamine as a separate type require a more significant bone structure than G has to pull them off. So I’m not a “curvy FG” at all. I’m a regular old FG, no special changes necessary. I’m fleshier, because I’m a little overweight, not because I’m “curvy.” “Broadly angular” is how I would define the overall theme of my body shape. I have broad shoulders and wide, flat hips with angles in between. The Flamboyant Gamine recommendations as written respect this. The issue arose when Gamines who are a little more yang were folded into FG. This does both groups a disservice. Suddenly the overall picture of the FG body shape gets a lot more narrow. Those of us who have the bone structure as described in the book somehow become the outliers. I don’t think that FGs should be split into “N-leaning” (broader) and “G-leaning” (narrower, aka Gs). This is just a workaround for a supposed change that actually over-complicates Kibbe’s system. When I say “I’m an FG,” it should be understood that my wardrobe is built around the Flamboyant Gamine recommendations. Yes, Kibbe says you should also read the chapters for Dramatic and Gamine, and that Gamine is more important for the overall picture. At thinner weights, I think FGs can pull some things from Gamine. When I was very thin, I even sometimes dipped into SG (although of course at that time I had no idea SG existed). If you are broad enough to carry off FG, you are not going to need Gamine to make FG work for you; it may just be a possibility to expand your wardrobe possibilities, and one you may not always have at all times in your life. Where I would use “leaning” is for Gamines themselves. I do see that there is variation in facial features that shows that the balance between yin and yang is not 50/50. But these Gamines should still base their wardrobes on the Gamine lines. Where they can pull from FG or SG is in things like pattern, jewelry, and even, in a way, “essence.” A Gamine that leans yang can easily pull off the mod and punk looks often associated with FG. And a yin-leaning Gamine might have even more of the “sweetness” and ingenue qualities ascribed to, sometimes mistakenly, to SG. Think Mia Farrow in Rosemary’s Baby. Unlike FG’s ability to steal from Gamine, this is something I don’t think would change over the course of your lifetime with weight gain and body changes. In my observations, it is mainly derived from facial features. So, in closing, I’d like to retract the entire idea of “curvy FG” and the idea of there being two kinds of FGs. When I say “Flamboyant Gamine,” I am referring to the Flamboyant Gamine described in the book, one that is not mixed up with Gamine. I consider myself to fit in this group with no exceptions needed. If Flamboyant Gamine had been presented this way to me to begin with, I would not have wasted months in Soft Gamine and Soft Natural because I felt I wasn’t skinny and lanky enough for FG. In the end, isn’t simplicity and clarity in a system like this what we need? Does Weight Gain Make You More Yin? This is a question that occasionally comes up among people exploring Kibbe. My answer to this, as it is for so many things involving Kibbe, is yes and no. 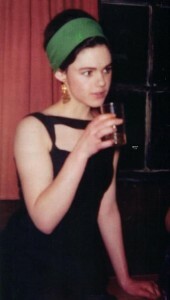 This is a picture of Edie Sedgwick at a heavier weight than the one that she was when she was famous. Does she look more yang in the photos where she is skinny? Sure. We see a sinewy, curveless figure. But I like the photo of Edie with the dark hair and heavier weight because I can see myself in it, and I see how the extra yin we see is an illusion. My arms now are a similar shape, and don’t have the length commonly associated with Flamboyant Gamine. In fact, that is why I spent so much time considering Soft Gamine. I am soft. But I am not yin-dominant. My ribcage has remained pretty much the same, but my limbs and hip area have gotten decidedly thicker–and more and more square. I came to Kibbe because of weight gain. I used to be very skinny and didn’t even understand what a “problem area” was, because everything looked good on me. But with weight gain, I no longer knew how to dress myself without hating what I saw in the mirror. In the Flamboyant Gamine recommendations, my problem areas were no longer a problem. Breaking the line in the right place emphasizes the nice shape my upper torso still has and and breaks up the boxiness of my bottom half. I see the magic that knowing your Kibbe type can do–which is why I can only shake my head when people try to dismiss the recommendations as being “too 80s.” Some details need to be tweaked, and we have to make allowances for the wonders of spandex, but the basic outline of how your type should dress has not changed. What flatters your body hasn’t changed. I asked some other Flamboyant Gamines what they thought, and the consensus seems to be that when skinny, an FG can borrow more from straight Gamine, and maybe even some from Soft Gamine. But with weight gain, you’re better off sticking strictly to the Flamboyant Gamine recommendations and not wandering off. I don’t know how it works in other types, but I wager that the results would be the same. So in my case, I have found that while weight gain may make me seem more yin at first glance, it has actually emphasized the yang qualities of my shape, and has made sticking to my yang FG recommendations far more important. Have you gone through a similar experience with weight gain and Kibbe? This is basically more or less on the same subject as my last post, but I thought it was important to give it a separate post because of my other posts on the subject. To recap, before, I thought that, if you were curvy, the difference between Flamboyant Gamine and Soft Gamine was in the face. I think you’ll still see a difference in the face, but there’s a difference in the body, too. The SGs and the FGs have a much more similar shape than we usually think of them as having. The main difference seems to be that FG will have angles and an SG will have a curve. Let’s look at Brigitte Bardot (SG) and Audrey Hepburn (FG). Brigitte’s measurements at one point in her career, according to this website, were 36-20-35. 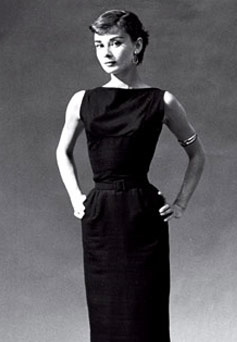 Audrey’s were 34-20-34. So relatively similar–Audrey is technically an hourglass, and Brigitte was a slightly top-heavy hourglass and just a little bit curvier by the numbers. Their shapes are incredibly similar… yet it’s clearly evident that the extra Romantic in SG has given a little bit of a curvy shape, and the extra Dramatic in FG has resulted in a shape composed entirely of angles. SG’s curve is not as dramatically curved as a Romantic’s, such as Elizabeth Taylor (36-21-36, so not too far off from our G women above). But you can still see the curve vs. angularity in FG. So what makes a “curvy” FG instead of a Soft Gamine? Angles instead of curves. I think you’d still be able to tell from the face, but it may be easier to see in body shape. Update, 6/24/15: Please read this post. I no longer believe in the idea of “curvy FG” as described here. I expanded my last post for some Kibbe groups on Facebook, and I figured I should put what I added here as well. So what does a curvy Flamboyant Gamine look like? In Metamorphosis, Kibbe says we can deviate from the guidelines, as long as these deviations don’t upset our yin/yang balance. We know that Kibbe has typed voluptuous hourglasses as Flamboyant Naturals when that is listed on the “NO” list for FNs, so why can’t it be the same for FGs? It all comes down to The Most Important Thing, or TMIT. For Gamines of either type, I think that TMIT is the face—not height, because there are Kibbe-confirmed FGs like Audrey Hepburn and Twiggy, who are above-average height, and not body type, because your eye is supposed to move around on a G and not focus on any one aspect of their physicality. Obviously if you’re six feet tall, etc., it may disrupt your yin/yang balance enough to move you out of gamine, but you get the picture. So if your face is a mix of D and R, but D dominates, it may push you out of SG and into FG, even if your body is more SG. For me, I would say my face is 1/3 R and 2/3 D, which makes SG’s rounded shapes not work and made me want to add bold geometrics to any type I was trying on. I have noticed that FGs who are closer to 50/50 in terms of their facial D/R balance tend to have the brick-shaped, coltish, very yang body we think of as being classic FG. They also can go more toward classic G in their clothes, and wear things like cigarette pants with Breton striped tee. They don’t need as much opposition/drama in their clothes. In a way, this is not much different from how SD works—SDs are either yang faces with yin flesh or vice versa. Kibbe doesn’t have a type for yang face/yin size/yin flesh. I think SD works in this case if your curves dominate and you project an SD type of sexiness. And I think FG works if the D in your face with some opposition of R dominates. To sum it all up, you can be a curvy/soft Flamboyant Gamine IF the opposition of Dramatic and Romantic in your face leans heavily to the Dramatic side, AND if the curviness and softness of your body doesn’t dominate over your facial features. When I first realized that I was a Flamboyant Gamine, I thought it would be difficult for me to follow the recommendations because I am curvy, rather than shaped like Twiggy. If you are asked how I ended up an FG then, you can read my entire series on this topic, which was written as this discovery was being made, but basically, Kibbe does not have a category for yin in size/yang in face/yin in flesh, and I score as a “G” on the quiz. But the extra Dramatic in my face takes precedence over the extra Romantic in my body. I know this because I need bold geometrics, not the rounded shapes you find in SG. So how do you do FG when you’re curvier than the average FG? What I have found is that it is not difficult at all. The narrow shapes and bodycon styles do enough to flatter curves, even if most of the example FGs are much straighter-looking than I am, for me to use the recommendations without having to make many concessions or alterations. What doesn’t work for curvy FlamGams? The “blouson” style dress. I’m also not a fan of dropped waists in general. I love the flapper-dress look on other people, but I need more construction and for things to be tight. I would also look at Gamine recommendations, but I think all FlamGams should, whether you have a yinnier face and a straighter body or a yangier face and a yinner body. The only thing I take from Gamine, though, is move the waist up to my natural waist, instead of a dropped waist. Despite my curvier figure, Gamine is actually still too delicate for me. If you are still finding that FlamGam isn’t working that well for you, you may well be another type completely, and that’s okay. But in the meantime, I attempted to make my first-ever Polyvore to illustrate, using Kelly O., the patron saint of non-Twiggyesque FlamGams. I actually own the dress on the left, and it is gorgeous for a FlamGam who has a conservative event to go to. One of the most interesting things about Flamboyant Gamine is that it is yin, sharp yang, and blunt yang. We have all of the elements of Kibbe’s system, and they are all in opposition with one another. A wide variety of Flamboyant Gamine bodies and faces is to be expected, so don’t worry if you feel like you don’t exactly look like the typical FG. The proof is in the recommendations.